Travel | Dallas Morning News: "Curtain Bluff Resort, Antigua, West Indies. 'Mom! I saw a barracuda!' That, from an excited 10-year-old boy fresh from one of two daily snorkeling excursions to a nearby reef. 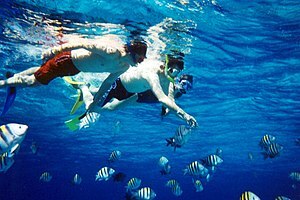 The family-owned and -operated resort in the West Indies is all-inclusive, meaning all snorkeling gear and an in-the-water guide is included with your stay. Want to do even more? Kids will fall into bed each night exhausted from water skiing, sailing, rafting, deep-sea fishing, paddle-boating and kayaking. Ask about summer deals."